These pochades from Guerrilla Painter offer the freedom and flexibility of a French Easel without the hassle. 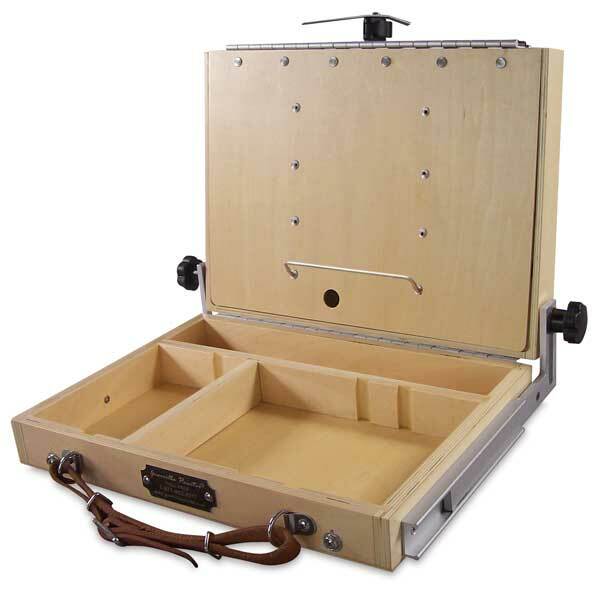 The two-in-one French Resistance design allows artists to paint canvases or panels and then transport them back to the studio with ease. As flexible and portable as a French easel, French Resistance Pochades are fitted with a universal tripod mount for use with a standard camera tripod. They can also be used on a tabletop. Inside storage compartments hold paints, brushes, tools, and more, and the lid locks in any position up to 180°. Lighter and easier to carry than a French easel, French Resistance Pochades are constructed of strong basswood laminate with stainless steel screws and aluminum hardware — no cracking or splitting! The French Resistance Pochades are equipped with durable leather carrying handles. They also have sturdy metal clips that accommodate an optional shoulder strap (sold separately). Note — Tripod not included. French Resistance Palette Extension Kits — Hinged Palette Extension Kits can be mounted on either the right or left side (or both sides) of the pochade. Because of the special offset hinge, they will fold down into the box, allowing the lid to close. Aluminum offsets keep them from contacting the inside surface of the box, so paint does not have to be removed before packing up. Each extension features holes for brushes and a parking slot for the Guerrilla Painter Hang Up Brush Caddy. Simple assembly is required and all hardware is included. Choose Medium or Large to match the size of your French Resistance Pochade. French Resistance Medium Palette Kit — This hand-held, oiled wood palette is designed to be stored and transported with wet paint on it (no need to clean up before heading home). It attaches to the inside lid of the Medium French Resistance Pochade with the included hardware. It measures 8"L × 12"W.
Web Shoulder Strap with Shoulder Pad — This adjustable, lightweight nylon carrying strap has a shoulder pad that makes toting your Cigar Box virtually effortless. Sturdy and economical, with high-impact plastic clips, it measures 1½" wide and weighs only 3 oz and is also compatible with other Guerrilla Painter Pochades and Wet Painting Carriers. Watercolor Palette, 6" × 8" — This palette features 14 slanted color wells (12 small wells and two larger wells), a mixing area in the palette, and another mixing palette inside the lid. The size is ideal for use with both the Medium and Large French Resistance Pochades and the ThumBox. French Resistance Medium Pochade Kit — This set includes a Guerrilla Painter French Resistance Medium Pochade, Web Shoulder Strap with Shoulder Pad, Large Mouth Single Palette Cup, Mighty Mite Brush Washer, Set of 4 Flat Pocket Bristle Brushes, 9" × 12" Plein Air Gessoed Panel, and Composition Finder, plus A Guerrilla Painter's Notebook volumes 1 and 2 (containing company founder Carl Judson's essays on his adventures in Guerrilla Painting). Nylon Utility Strap — Made of lightweight nylon with plastic clips, this 1" wide utility strap is compatible with all Guerrilla Painter Pochades and Wet Painting Carriers. French Easel Accessory Kit — Pair this accessory kit with the French Resistance Pochade to create an organized outdoor painting space. The kit includes a hang-up brush caddy, a hook, a paper towel holder, a composition finder, and a Mighty Mite Jr. Brush Washer with a 2 oz (59 ml), solvent-resistant Pet jar and stainless steel insert. Covered Palette Tray, 6" × 8" — Suitable for use with watercolors, oils, or acrylics, this covered palette tray from Guerrilla Painter is constructed of extra-durable, double-thick, high-impact white polystyrene and features a tight-fitting lid. Oil painters find this tray a great way to keep their equipment neat and tidy while saving their paint for several days. Watercolorists who like to use butcher trays feel right at home because of its unrestricted work area. French Resistance Medium Pochade — The Medium French Resistance Pochade measures 10"L × 13"W × 3"D and weighs just 3¾ lb. It holds any size panel or canvas from 4" × 6" to 16" × 20". Leather Shoulder Strap — This adjustable, heavy-duty strap is crafted from durable harness leather. It is fitted with high-quality nickel-plated trigger clips that attach to rings on your Cigar Box for convenient carrying. Mighty Mite Jr. Brush Washer — This is a lightweight, leakproof 2 oz (59 ml) plastic jar that is resistant to chemicals and includes a removable stainless steel screen assembly. ® Guerrilla Painter is a registered trademark.™French Resistance Pochade, Mighty Mite Jr., and Backpacker are trademarks.